So many people have been letting me know they want to buy tshirts! It means so much that so many friends want to wear "I'm In It For Bennett" on their chest. I can't wait to see the flood of green at the Walk. It just touches a mother's heart to imagine something so sweet. And then, to know people far away who can't even be at the Walk want tshirts too. Man, my heart wants to explode with gratitude! Anyway, I wanted to make sure I reposted the tshirt information so nobody accidentally misses out if they want one. 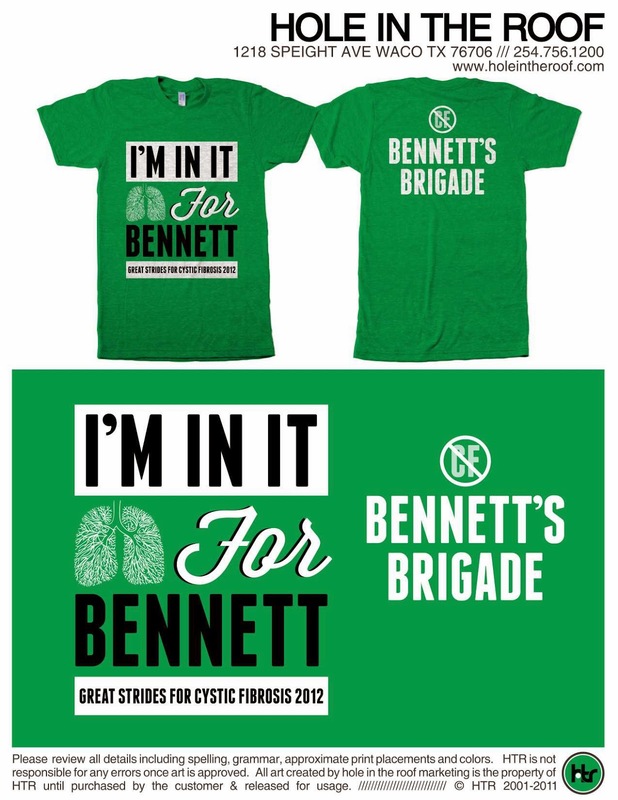 Cost: $15 ($5 from all adult shirts will go to the Cystic Fibrosis Foundation). Free Shirts: Our family will give your family a free tshirt if you donate $100 or more. To order: Email me at breckgamel at yahoo dot com with your size and address. Payment options: Check is best but if you have another idea, I'm open! I'll send you the address, just email me. your shirts are awesome!! Love them!